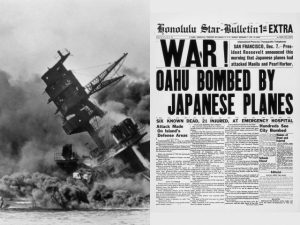 For British Prime Minister Winston Churchill, the December 7, 1941, Japanese attack on the US naval base at Pearl Harbor was, “The greatest day of the most horrible war.” The war had been going poorly for the Brits and now the prospect of the US joining the fight bolstered Churchill’s outlook. “We should not be wiped out!” he said. American Virginia Hall, spying for British intelligence in Vichy France, was relieved US military forces finally were in the fight, though she knew it would complicate her life as a spy. No longer would she be able to use US neutrality as a shield when traveling through France. Americans would be placed under greater scrutiny by the German military and French secret police. Faced with greater danger, Virginia chose to tighten her personal security. She wrote her last article for the New York Post in January 1942 and postmarked it, “Somewhere in France.” That same month she changed residences from Lyon to the Hotel de la Paix in the capital, Vichy, and began using the name, Brigitte LeContre on her “official” documents. Virginia sent a coded message to London in early January telling her spymasters that letters addressed to her had stopped arriving since America entered the war. Coded letters, frequently employing secret writing or other enciphering techniques, were an important channel of communication between London and its agents in WWII France.